A couple of years back, I was talking to a guy who happened to have quite a few tattoos. We got to talking about tattoos and he began to show his artwork to me. He pointed to a particularly large tattoo on his arm of a Native American on a horse and told me that he liked Native American tattoos because they never went out of style and always looked cool. True, his interest in this culture wasn’t anything more than a superficial one, but I think that such attitudes are often common when it comes to tattoos. Which is a shame really, because the tradition of tattoo does go back deep into the Native American culture. Unfortunately, through a disastrous course of events over the centuries involving colonialism, assimilation and outright murder, the practice of traditional tattoo is yet another loss sustained to the Native American way of life. Say the words Native American tattoo to someone, and it’s far more likely that the imagery such words conjure are the sort that were found on my friend’s arm: images of Native Americans that are more Hollywood than actual Native American tattoo art. It is known that numerous tribes utilized tattoo work to mark their clan or family lineage. The Iroquois Nation, which consisted of numerous smaller groups such as the Mohawk and Cayuga peoples, are one such tribe. The Mohawk tribe for example, was represented by the Turtle, the Wolf and the Bear. 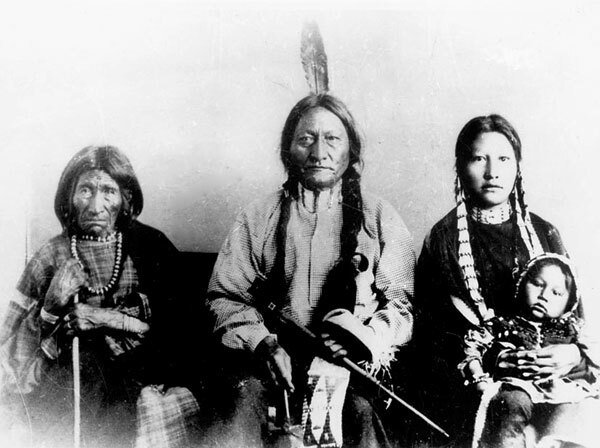 Some tribes tattooed women as well as men, but some, like the Sioux, tattooed the women and not the men. But of course, mentioning these three tribes is not even scratching the surface of Native American history, culture and practices. People are of course, free to be tattooed with whatever they feel like being tattooed with, but when it comes to Native American artwork, understanding what it is that you’re going to be getting tattooed on your body is extremely important. A little reading up on the various tribes is always the best place to start. If you’re interested in getting a Native American tattoo, this is worth reading first. Also, if you’re looking to get a script tattoo in a Native American language, this is an excellent resource. For a $10 fee (which goes to a nonprofit organization), you can have your script translated into a Native American language of your choice (the service offers plenty to choose from). In its true form, Native American tattoo work is vastly underrepresented. Hopefully one day we’ll see more of a resurgence and general understanding of these long lost culturally and artistically significant practices.